The West End Cul­tur­al Centre’s 2018 – 2019 con­cert sea­son draws to a close with one last Throw­back Thurs­day per­for­mance. But this one’s on a Sat­ur­day! May 4th the stage at the WECC once again plays host to a rag­tag group of Win­nipeg musi­cian who got their first big gig there 30 years ago. Don’t miss out on the instru­men­tal mad­ness of Acousti­cal­ly Inclined, includ­ing their infa­mous Pur­ple Haze cov­er and a clutch of clas­sic orig­i­nals. 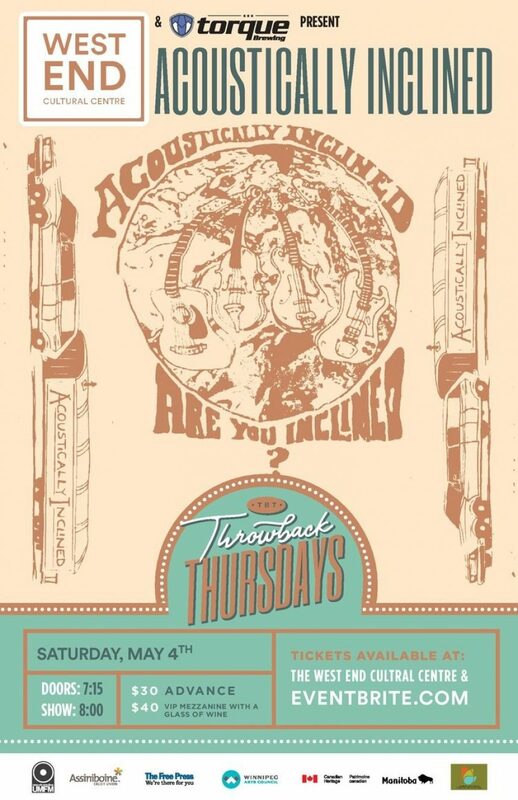 Torque Brew­ing presents Throw­back Thurs­days at the West End, with Acousti­cal­ly Inclined on Sat­ur­day May 4th, proud­ly pre­sent­ed by 101.5 UMFM.